In recent years it has become more feasible than ever to navigate using a smartphone or tablet. Apps have improved to the point where they rival paper charts and chartplotters. With so many good navigation apps available, the question is: which is best for you? In recent years it has become more feasible than ever to navigate using a smartphone or tablet. Apps have improved to the point where they rival paper charts and chartplotters. With so many good navigation apps available, the question is: which is best for you? There are free apps with basic chartplotting capabilities; reasonably priced apps with advanced waypoint and route management features; and apps with community-authored databases that include points of interest (POI). Ultimately, choosing an app comes down to evaluating which features are important to you and what you’re willing to pay for them. In researching, consider some differentiating factors. Most important is the chart availability and type of chart used. In the United States, the most commonly supported charts are NOAA raster charts, which are scanned images of traditional paper charts. Raster charts are larger in size with more complex chart management and display features. NOAA vector charts, on the other hand, span larger areas, offer seamless display between chart areas and allow the user to pan and zoom. They also support multiple layers, each with different levels of detail. 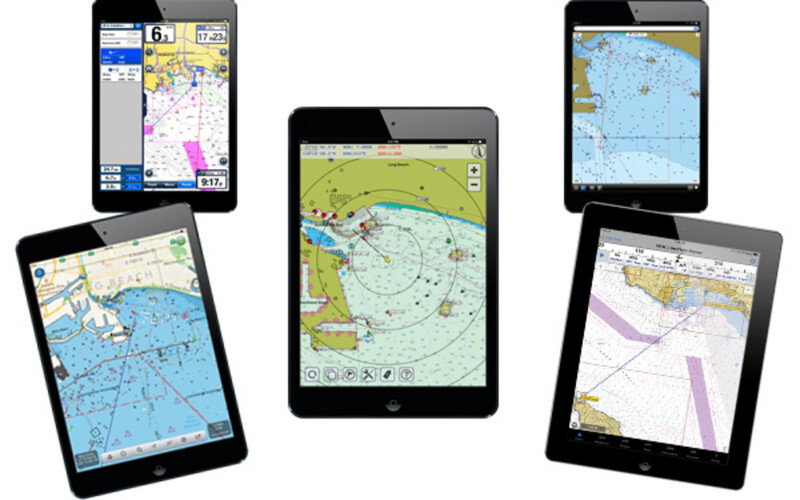 Garmin, Navionics and Transas also provide worldwide chart regions. Also be sure to check the chart management functions. When using an app, managing the charts should be as simple as selecting, downloading and installing chart tiles or regions. An app should allow you to store charts on the device so they can be used while underway and offline. Check for the added features of a street map, satellite or topo/terrain map overlays. All nav apps display a ship’s location in a similar manner. What works differently is panning or zooming around the chart, chart quilting and displaying chart layers. Look for an app with usability that makes sense to you, one that has an uncluttered display, transparent overlays, intuitive menus and easy-to-use zoom buttons. All apps support waypoints, routes and tracks to a varying degree. The more established apps allow you to manage waypoints and create routes using selected waypoints from a predetermined list. Newer apps manage routes by connecting marks on the chart, so actual waypoints become less important. I prefer apps that allow you to manage waypoints and routes, and import them via GPX, a data format that allows you to share GPS information across multiple devices. Sharing tracks via email or social media sites is also becoming popular. This is a great way to communicate with friends and family during a cruise or race debrief. Likewise, apps that allow you to geotag photos to waypoints are useful, as you can record photographic reminders of various locations. Integration with community guidebooks is another new feature that is useful for route planning. Several apps support ActiveCaptain, a community-generated interactive cruising guidebook with markers for marinas, hazards, anchorages and local knowledge. Similarly, the Navionics Community provides marine POI and guides. In both, the added information is invaluable for planning a route. Finally, cost is important when picking your nav app and prices range from free to $50. Check if the app includes NOAA charts—if it doesn’t, chart regions will cost between $20 and $100. The current trend is to charge an annual subscription fee that includes chart updates. This is one of my favorite navigation apps, because it is based on Garmin’s excellent BlueChart marine charts and is so easy to use. The radial menu, waypoints and route management are extremely intuitive. While underway, your position and selected route display clearly. The app has a complete set of features, including tides and currents, sun and moon phases, wind speed and direction, and a distance-measuring tool. For route planning, the app integrates with ActiveCaptain, which I consider a huge plus. You can also sync between Garmin devices, planning a route on, say, your iPad, then wirelessly syncing it with your Garmin chartplotter. The app is not intended to replace a chartplotter, but it is well suited for route planning. Unless you’re connected to a Garmin Quatix watch or an onboard Garmin network, the app cannot enable an active route, provide a “go to” navigation display or import waypoints and routes. 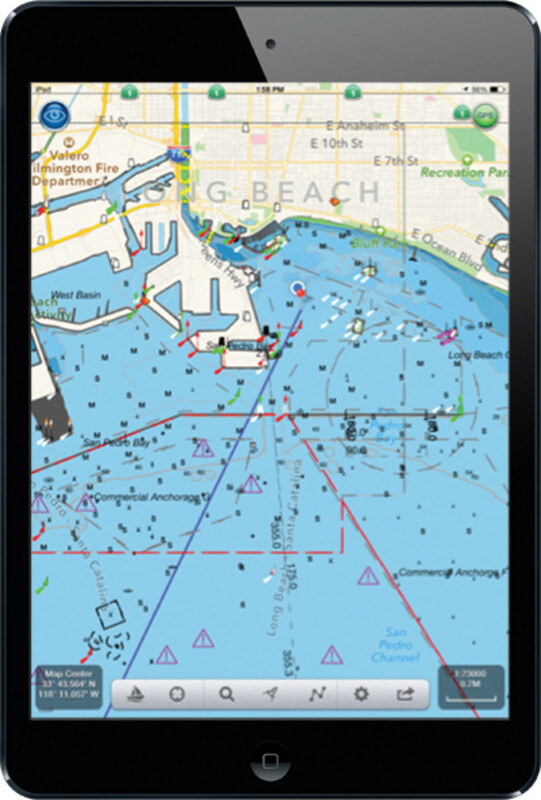 Garmin BlueChart Mobile is free and includes a high-level world chart; BlueChart maps can be purchased in-app (U.S. Coastal $29.99, North America $44.99, European regions $119.99). For $3.99, you can also get “premium weather,” including radar and satellite imagery. 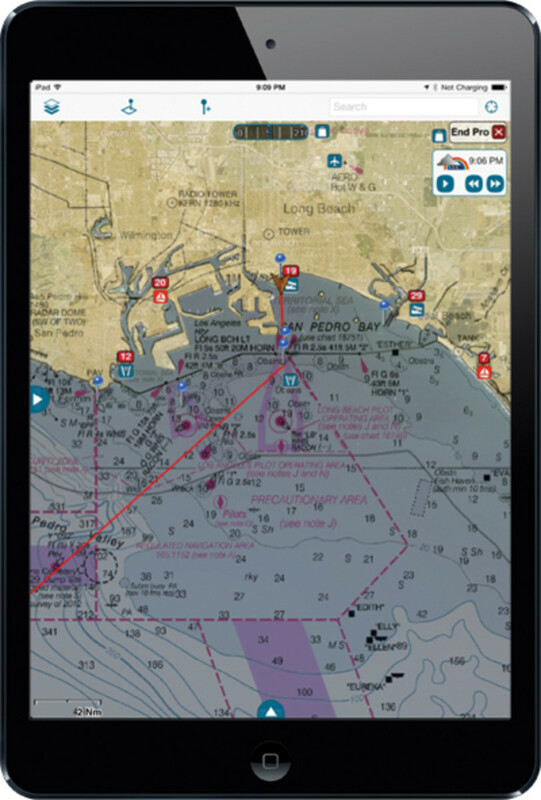 NavX is one of the most established navigation apps and supports free U.S. NOAA raster charts as well as several other charts and maps that you can purchase separately. Once installed, the charts are saved in a traditional chart table menu, which groups charts according regions. Once a chart is selected, your position is displayed real-time, with the ability to pan and zoom. To select a different scale chart, return to the chart menu or zoom in and out, and then select the appropriate scale chart. 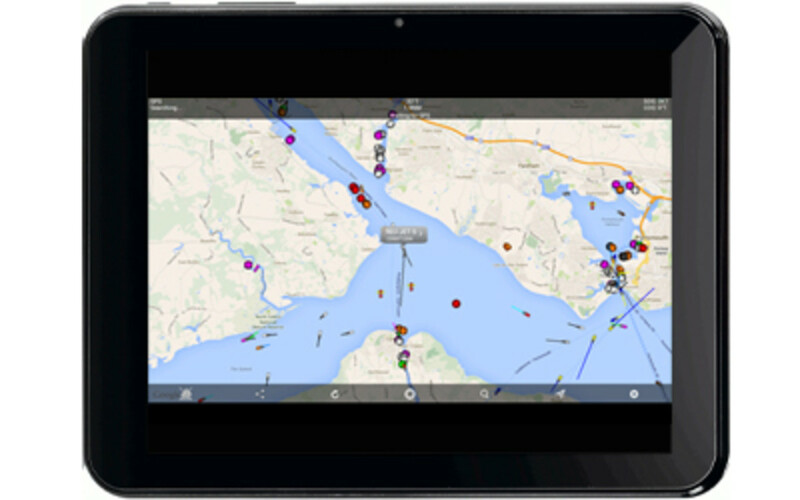 The app features waypoint and route management, GPX import/export, GRIB weather forecasts, tides and currents and port/navaid search. It even integrates with NMEA data over Wi-Fi to serve as a repeater for GPS and AIS. It does not include community guidebook integration. Although iNavX is probably the most full-featured navigation app around, it is not the easiest to use. I like its route planning, ability to import waypoints and built-in NMEA data display, but the chart interface itself is a bit awkward and, at times I had to close and reopen charts to get them to load properly. At $49.99, the app is competitively priced and is viewed by many as the standard. 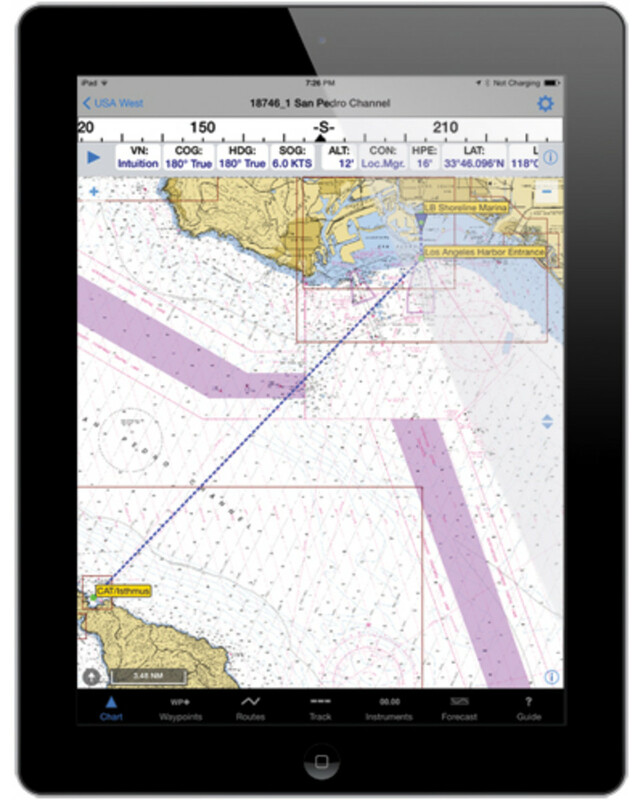 iSailGPS is one of the least expensive navigation apps that uses the free NOAA raster charts. The app features chart download and management, as well as import/export of waypoints, routes and tracks. While navigating a route, data for position, distance, speed, bearing and heading are all displayed at the top of the screen. This app is clearly intended for navigating while underway. I especially like its navigation, waypoint and routing capabilities, and its ability to import/export waypoints and routes. However, it does not work well as a planning tool, as there is no guidebook or POI detail. I also find the various actions—drag, zoom, pan and center—difficult to remember, and I frequently had to refer to the online manual for help. For the price, $7.99, iSailGPS provides sophisticated waypoint, route and track features, in addition to a usable chart display. For local sailing, it works well. iSailor is a relatively new navigation app with a stunning user interface and an extensive chart library, grouped into chart folios of TX-97 vector charts. Chart regions cover most popular cruising areas in the world and start at $4.99, with larger areas for $24.99. Running on either an iPhone or an iPad, iSailor supports route and track views, as well as all of the integrated information in a vector chart. Waypoints and routes can be imported and exported via GPX, though I found it difficult to place waypoints when constructing routes. iSailor allows you to add objects to your own downloaded charts, but lacks community markers and guidebooks. Overall, iSailor is an impressive new entry in the nav app space, and I look forward to its future releases. 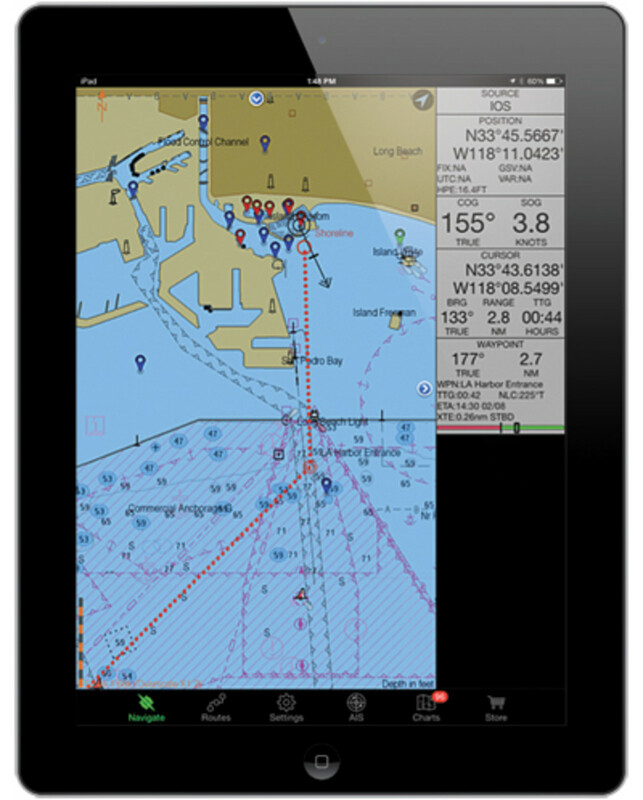 Navimatics is another one of the more established nav apps. The app itself is free and utilizes standard NOAA vector charts, which can be purchased by region. (U.S. regions start at $19.99, U.S. & Canada West at $24.99.) The app features chart-quilting for seamless display, as well as a built-in search function for finding any location, marina or navigational item—something I find very helpful. While under sail, a unique Horizontal Situation Indicator graphically displays your route’s current track, desired track and cross-track information. The app includes information on tides and currents, sun and moon position, current weather through National Data Buoy Center stations, and community guidebook information via ActiveCaptain. 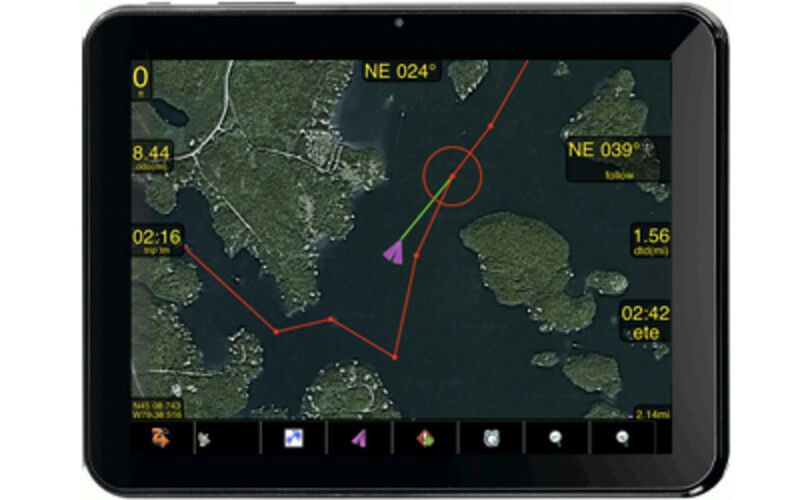 Navionics Marine & Lakes has long been one of the best navigation apps available for Android and IOS devices. 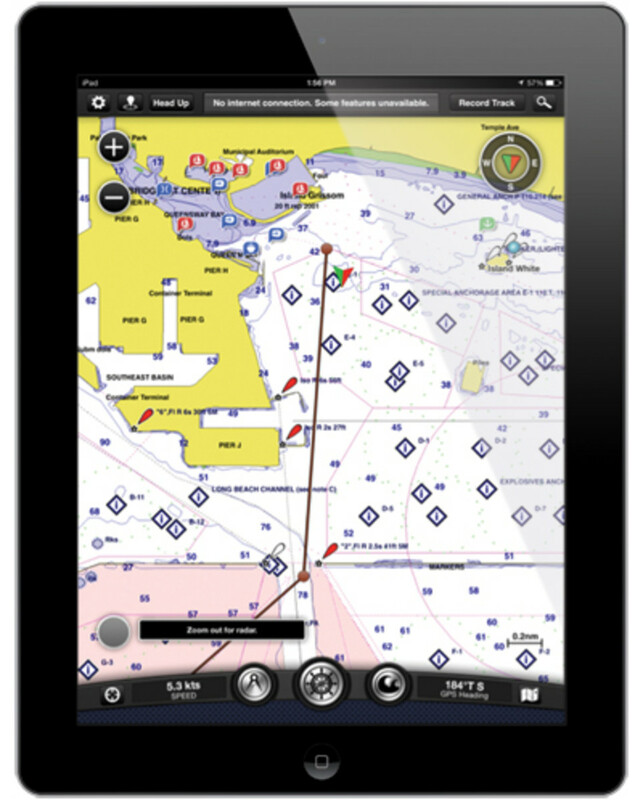 It incorporates the excellent Navionics Gold vector charts with map, satellite and terrain overlays, all for free. The user interface is intuitive for panning and zooming; tap on the chart to display a cross-hair pointer that can either become a waypoint or display local information on weather and tides, wind forecasts, currents and moon/sun phases. Creating and editing routes is a matter of placing marks along the route; edit by moving or deleting marks. Tracks can be shared via email or social media. 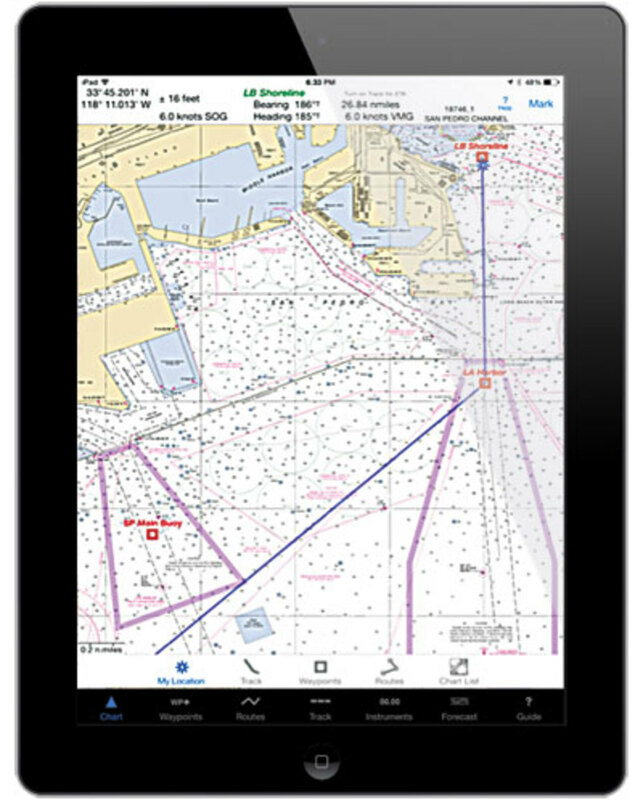 For advanced navigation features such as auto-routing and sonar charts, purchase in-app enhancements. 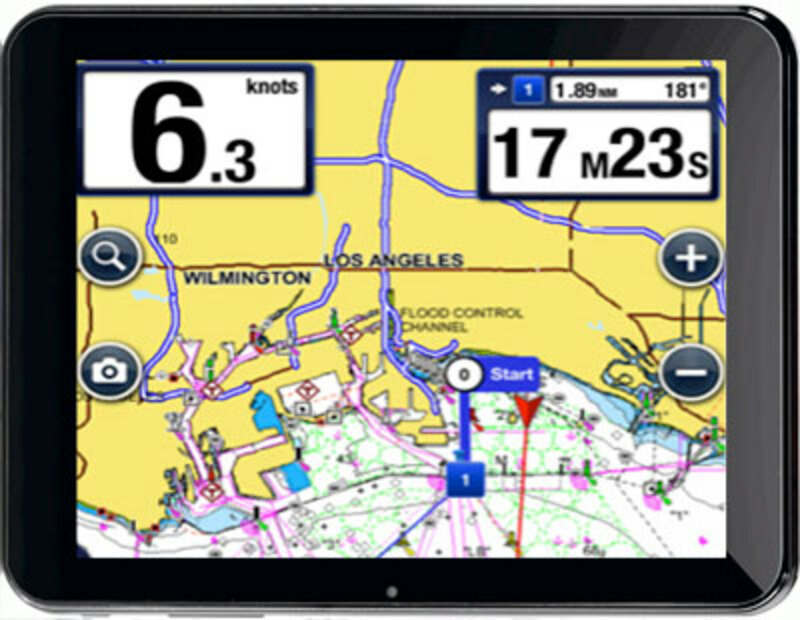 This past spring, Navionics came out with a new version of the app called Navionics Boating, which has all of the features of the original plus some extras. For example, it allows for Plotter Sync through which users can wirelessly transfer routes and waypoints from their app to a plotter. (Raymarine, Navico and some Simrad, Lowrance and B&G models are also Sync-capable.) It also integrates with the “Navionics Community,” a group of some 1.5 million users that regularly contributes to a directory of marine services, waterfront restaurants, magazine articles and travel guides. Most recently, this Community has been tasked with improving the charts of the East Coast by sharing its local information. Finally, unlike the old app, new chart regions seamlessly blend together with existing charts. The app is free, but you must purchase chart regions and other upgrades. If you already have Marine & Lakes, it will update to Boating for free the next time you update the app. (U.S. & Canada $54.99, U.S. $49.99, other worldwide regions starting at $54.99; Nav Module $4.99, AutoRouting: $4.99, Advanced Map Options $4.99, 1 Year Annual Chart Subscription $54.99). PolarView MX is a free app that integrates with ActiveCaptain and supports NOAA vector and raster charts. The space within the display is used effectively, providing maximum detail without a lot of overlays or unnecessary functionality. Real-time navigation information, including GPS position, SOG, COG, distance and bearing, shows at the top of the screen in a transparent layer. For the price, Polarview MX is quite usable. The app lacks waypoint, route and track features, but if you are looking for a free off-line NOAA chart viewer with ActiveCaptain, it will work fine. It offers a solid entrée into basic chart plotting on your iPhone or iPad. SEAiq USA/Free is rapidly becoming my favorite nav app. It uses NOAA and U.S. Army Corp of Engineers raster charts, and also supports ActiveCaptain. Within the basic free version, you can search charts by region and download by set. Regions can then be easily enabled or disabled, depending on where you’re sailing. Routes are created by selecting from the list of waypoints; route segments can be shuffled around and reversed. 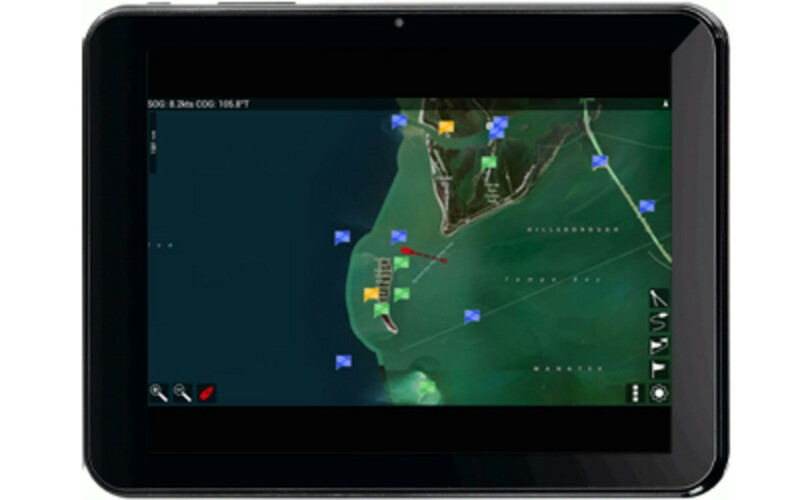 The free version includes a seven-day trial of the premium version (typically $24.99), with features such as vector charts, waypoint and route management, importing via a GPX file, chart display customization and anchor alarm. The premium version supports AIS Sharing (it downloads AIS data from a shore-based network of AIS stations)and receives NMEA data over the boat’s wireless network, a feature that worked great on my boat. SeaNav US/UK is a relatively new navigation app by PocketMariner that borrows its style and many of its features from the company’s signature app, Boat Beacon. With SeaNav a user can plan and navigate with NOAA vector charts in the United States and UK Hydrographic Office (UKHO) charts in the UK and Ireland. Chart tiles automatically download as you scroll the high-level map view, and the display includes map, satellite or hybrid modes. Tap on the chart to explore objects, such as buoys, lights, bridges and ships, or to search for a place or its coordinates. The augmented reality view also shows a live camera view from buoys and ships, including their names, range and bearing. At $14.99, this is a great value for a basic app. I like its many features, though the app is sluggish at times, and I often had to look up the button functions in the help manual. Skipper is an exciting new app that utilizes NOAA raster charts and automatically stitches them together for seamless display. Street maps, satellite imagery, and USGS topo and terrain maps can also be overlaid on charts with varying levels of transparency. The free app provides a basic simple-to-use NOAA online chart viewer and satellite imagery. For an annual subscription of $9.99, you can also store charts offline, manage waypoints and routes, sync across multiple devices, display weather and tides, and sync with ActiveCaptain. Compared to other apps, the subscription seems reasonable considering the rich set of features and chart overlays that’s included. 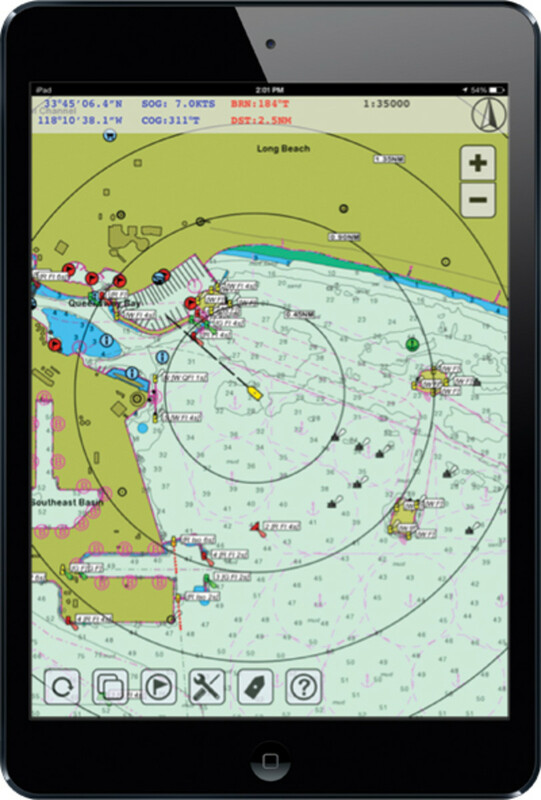 BoatBeacon is a handy app for navigating high traffic anchorages and areas not far offshore. So long as the user has an Internet connection (typically no more than 15 miles off the coast), they can track boats on AIS as well as boats without AIS that are using BoatBeacon. With BoatBeacon, sailors can view other ships’ photos and details like CPA, speed, heading and size. The app also continually updates positions and AIS even when it is running in the background. Thumbs up: collision-avoidance is always “on”; thumbs down: so is the drain on your battery. Finally, the app has a social aspect that allows users to share data with friends and family through email, Facebook or Twitter. It was one of SAIL’s favorite apps in 2013. Like many other navigation apps, the PathAway Express app plots tracks, waypoints (with photos as well as descriptions) and routes. The distinguishing feature of the Fugawi PathAway Express Edition app, however, is that it allows users to create customized charts and multi-layered maps. One of the app’s newer features is a Weather Forecast map that can be layered onto other charts and displays conditions such as wind, precipitation and temperature. This feature does, however, come at an added fee. 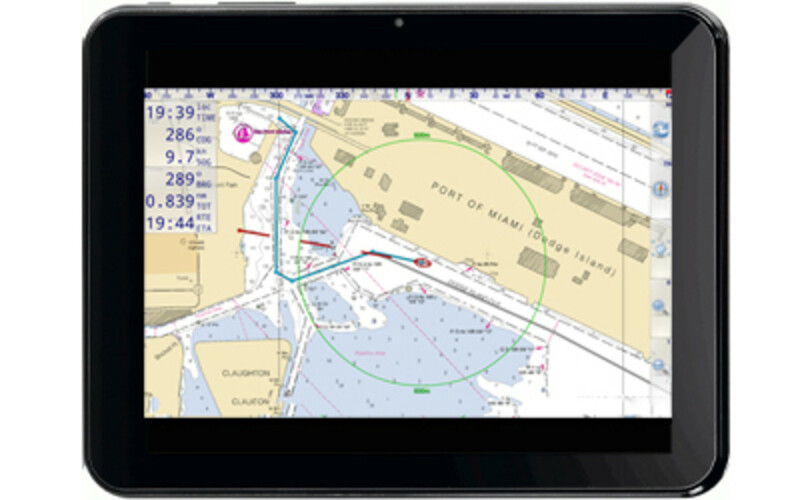 With PathAway, sailors can import maps from practically anywhere—whether from an online source like Google maps, or downloaded from PathAway maps or any other BSB/KAP navigational chart application. There are a few versions of the app. 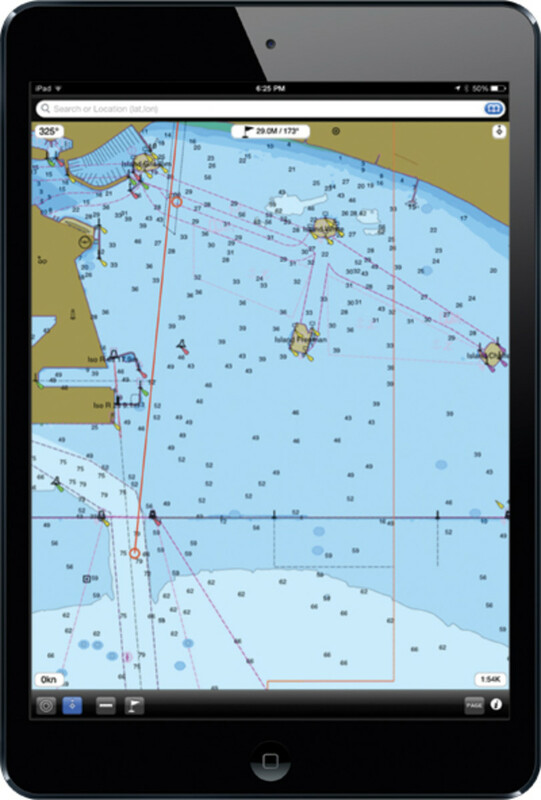 In PathAway GPS Professional Edition ($49.95), users can track other boats as well as display several tracks and routes simultaneously. The free version includes the basic tracking functions, but its charts are not full-screen due to advertisements. PathAway GPS Lite ($4.95) offers the same functions as the free version but is full-screen and does not include ads. 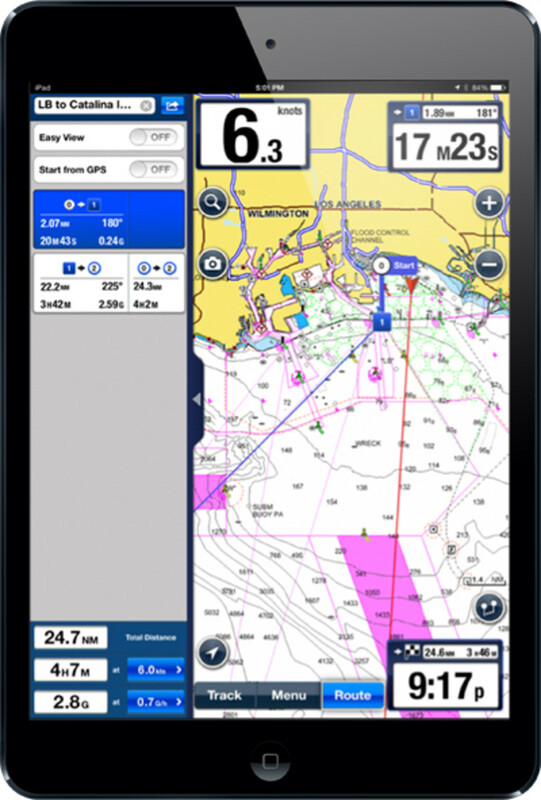 Marine Navigator is the advanced version of the free navigation app, Marine Navigator Lite. Marine Navigator allows for free online download of NOAA raster charts, or any other BSB/KAP navigational chart for that matter. It displays a boat’s position, SOG and COG, while allowing the user to add in tracks, waypoints and routes, which it records whether the app is active or running in the background. Waypoints and routes can be imported and exported with GPX, and tracks exported with GPX. 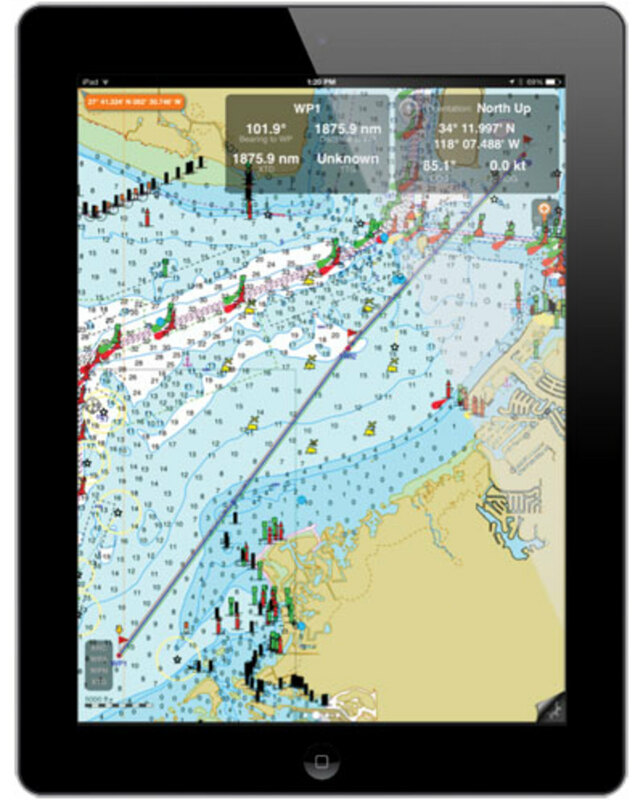 Charts link seamlessly and update automatically based on the boat’s location. Marine Navigator also displays a compass and includes features for MOB situations. MX Mariner allows for free installation of raster charts from NOAA, as well as LINZ in New Zealand, UKHO in the UK and Ireland, and the Brazil Navy in Brazil. Offline, the charts are static. Online, the charts show detailed maps with roads and satellite images. The app displays not only a boat’s current position but SOG and COG as well. MX Mariner also allows users to plot waypoints, tracks and routes by importing them as GPX files. As a bonus, the app features multiple light settings for a variety of conditions—whether you’re sailing mid-day or at sea in the dead of night. There are so many quality navigation apps on the market, it’s difficult to choose just one. The features I consider most important are: chart management (navigation, routes and waypoints), ability to import/export waypoints, community guidebook integration (though I’m not a fan of storing the database on my device), integration with an onboard NMEA and WiFi network, and ease of use. Based on these parameters, I am partial to the Navionics and Garmin apps, though recently, I’ve also been recommending SEAiq and iSailor. Depending on your requirements, any of these apps will be a good choice.